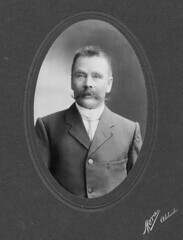 Charles Mortimer Lipson was born on 6 Sept 1854 in Albert Town near Port Adelaide. He was the eldest of four sons of Thomas Hardy Lipson (1823-1862) and Rebecca Beverly Mortimer (1835-1913). He had three brothers – Thomas Edwin (1857- ), Arthur (1861- ) and Richard (1862-1864) b. & d. at Willunga. 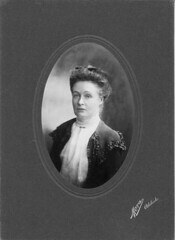 His mother, Rebecca, was probably from the Mortimer family (parents - Richards and Rebecca) of Willunga, which is why she returned to Willunga with her three young sons (Charles 8, Thomas Edwin 5 and Arthur 1) in 1862 after the death of her husband, Thomas Hardy Lipson, aged just 39 years. Charles grew up in Willunga and he went to the Bassett Boy’s School. Charles was the Secretary of the Willunga Cricket Club in 1882 and auditor for the Willunga District Council in 1883, 1886, 1887, 1888 and 1894. He was Captain of the Willunga Lifeboat Crew in 1884 and Secretary of the International Order of Rechabites (I.O.R.) in 1886 (and was still active in 1892). In the 1880s he was Color-Sergeant in the Willunga Company of the Volunteer Force and he was promoted to Lieutenant in 1888 and Captain in March 1889. In 1891 he resigned from the Volunteer Force and was appointed as a Captain in the Mounted Infantry. Charles Mortimer Lipson, aged 91 years, died on 31 July 1945. Do you remember Lipson, Charles Mortimer ? Then Join up and add your memory here.